64 tooth spur gear, RC10GT May fit other kits that use 32 pitch standard style spur gears. App..
6061 T-6 Aluminum A-Arm \ Motor Mount For The RC10GT By R&D Racing. Color- Blue. ( Fits Black Tu..
Silver Alum. Exh. Manifold for P/S ..
Associated GT Wide Front Aluminum Axles, Blue. 1pr. ..
Associated Outer Hinge Pins, GT2 ..
Associated Top Plate, GT2- PN7893 ..
Front Arms for RC10T, RC10T2 and RC10GT May also fit other Team Associated kits of that time. ..
Front Suspension mounts, black molded nylon. Fits: RC10, RC10DS, RC10GT, RC10Worlds, RC10T2 and p..
RC10GT Hardened Steel Idler Gear Fits RC10GT and possibly others Associated vehicles. ..
RC10GT Flywheel Collett With Shim ..
RC10GT Throttle/ Brake Linkage ..
T2 Battery Foam pads. 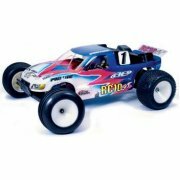 Fits RC10T2 directly, but could be cut for other kits. Foam is 1/8" thick. ..
Rear Shock Mounts, RC10GT Fits: RC10GT and possibly more Associated truck kits. .. Shock Caps with Bleeder Screws. Fits Team Associated shocks up to Big Bore. Does not fit new Big ..
D Size Glow Ignitor, Fits Associated And Other Nitro Powered Models. ( D Battery Not Included). ..